Today, March 24, makes it exactly two decades since Nigeria lost one of its foremost heroic figures, the late Major-General AbdulBaki Babatunde Idiagbon, to the cold hands of death. 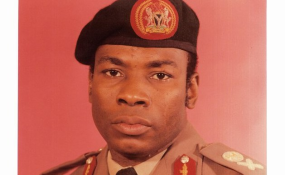 General Tunde Idiagbon, as he was simply known, was a celebrated soldier, an accomplished statesman and a remarkable 'political figure' who served as the Chief of Staff, Supreme Headquarters (de facto Vice President) of the Federal Republic of Nigeria between December 31, 1983 and August 27, 1985. He was an effective second-in-command to his alter-ego, Muhammadu Buhari, who at the time was also a Major-General. Mr Idiagbon, who was of Fulani ancestry, was born in Ilorin, Kwara State, on September 14, 1943. His father was the late Hassan Dogo, who died in 1978. Mr Dogo was a cattle merchant in the Oro-Ago axis of the present day Ifelodun Local Government Area of Kwara State, before returning home after retirement. Mr Idiagbon's mother was late Aishat Dogo from the Bolanta area of the ancient city of Ilorin. Just like most of his predecessors and contemporaries in Ilorin and the rest of northern Nigeria, the late no-nonsense military tactician adopted the name of his ancestral family compound as his official surname, which he bore with total respect and pride throughout his eventful sojourn on earth. That singular act of name-bearing not only explained his respect and affinity for his roots but also won for his illustrious forebears and their descendants, veneration of unimaginable magnitude, till date. General Idiagbon did not just embrace stardom or get connected to immortality, he worked for the two by struggling to be educated, building a worthy personality and believing so much in the dignity of labour. Whenever he was on holiday in Ilorin, Mr Idiagbon hawked water across the city before graduating to become a newspaper vendor under the then doyen of journalism in Ilorin, who later served as the national president, Nigerian Union of Journalists, Micheal Asaju, of blessed memory. The late general attended the Ilorin United School, an institution founded by the Ilorin Emirate Descendants Progressive Union (IEDPU), for his primary education between 1950 and 1952. In 1953, Mr Idiagbon proceeded to the Okesuna Senior Primary School, Ilorin, from where he finished his primary education in 1957. Among his mates, were Mr Yinusa, who was a commissioner for agriculture in Kwara and a former national president of the IEDPU, as well as his younger sister, Maimunat Oniyangi, the wife of A.S. Oniyangi, a former secretary to the military government of Kwara State and a former national commissioner with the Independent National Electoral Commission (INEC). Mr Idiagbon was probably among the first set of indigenes of Ilorin Emirate who enrolled in the Nigerian Military School, Zaria, which he attended between 1958 and 1962. He was, thereafter, enlisted as an officer into the Nigerian army and was commissioned as a second lieutenant in 1965 after successfully completing training at the Pakistani Military Academy, Kakul, from where he also bagged a Bachelor of Arts degree in Economics. He was, by that, one of the first officers who obtained a university degree while in the military service. In 1976, Mr Idiagbon went back to Pakistan where he attended the country's Command and Staff College. He also attended the National Institute for Policy and Strategic Studies, Kuru, in 1981. In 1982, he was at the Naval Post Graduate School, United States, from where he obtained an International Defence Management Diploma. He was also a distinguished member of the Nigerian Institute of Management. As an industrious, brave and gallant soldier, Mr Idiagbon never missed any promotion. He became a captain in 1968 during the bloody Nigerian civil war. In 1971, he was promoted to the rank of major and in 1974, he became a lieutenant colonel. He was decorated with the rank of a full Colonel in July 1978. In May 1980, this enviable son of Ilorin was elevated to the rank of a brigadier-general. He was eventually promoted to the rank of major-general in 1984. In the course of his outstanding military services, this gallant soldier held various command posts. He was the commander, 4th Battalion of the Nigerian Army from August 1965 to February 1966. He was the sector commanding officer, 20 Battalion from October 1967 to February 1968. He also served in the same capacity at the 125 Battalion from 1968 to 1970. This remarkable apostle of discipline was the brigade-major and deputy commander, 33 Brigade between March 1970 and March 1971. He served as the commander, 29 Brigade from March 1971 to December 1972. As a result of the military involvement in the political administration of Nigeria, coupled with his glittering erudition and alluring leadership skills, the late Mr Idiagbon was a star in the succeeding military regimes which ruled the country from the end of the civil war to 1979 and between December 31, 1983 and August 27, 1985. He was appointed the general staff officer, grade 1, and later principal staff officer, Supreme Headquarters, from January 1973 to August 1975. He also served as a member of the governing council of the University of Jos, Plateau State. Mr Idiagbon's direct political appointment, however, began in August 1978 when he was made the military administrator of the old Borno State. He was at the same time the commander, 33 Brigade of the Nigerian Army, Maiduguri, as well as a member of the National Council of States till October 1, 1979 when he handed over the administration of the then Borno State, which included the present day Yobe State, to Mohammad Goni who was elected governor on the platform of the Great Nigerian Peoples Party (GNPP). From October 1979, General Idiagbon was the director, manpower and planning, army headquarters, till February 1981. Between 1981 and 1983, he was the military secretary (army). He was on that position when he and his colleagues overthrew the government of Shehu Shagari, which they accused of mismanagement of the nation's resources. While Mr Idiagbon was, no doubt, the engine-room, the brain-box, and the star boy of the military regime headed by Mr Buhari, the story of how he emerged as the deputy head of that corrective government needs to be shared for us to have an insight into that unique 'leadership partnership' he built with his lanky boss and friend. It was, indeed, very clear that neither Mr Buhari nor Mr Idiagbon was the initiator of the coup that toppled Shagari. They were, however, the greatest beneficiaries of the plot, courtesy of their integrity and decency. Mr Buhari was said to have been invited to head the government as a way of adding the much-needed legitimacy to the desire of the military adventurists in power who initiated and executed the coup. Such invitation was premised on Mr Buhari's profound administrative experiences and infectious integrity, which characterised his career as the military governor in charge of the present day north-east region, as well as being the minister of petroleum and chairman of the Nigerian National Petroleum Corporation (NNPC). Mr Buhari was said to have accepted to lead the government only on the condition that he would be given the absolute liberty to select his deputy. Because Mr Buhari was so needed, he was allowed to make his choice and the lot fell on Mr Idiagbon because of their apparent compatibility in the realm of background, career path, integrity, personality, and political philosophy. It was, therefore, not surprising that the duo not only worked seamlessly throughout, but the latter was given free hand to operate. That alluring working relationship saw him dominating the government so well that for the first and only time in the political history of Nigeria, the names of the head and his deputy were used to 'nomenclate' the administration as the Buhari/Idiagbon regime, even when the head of state did not pass on while in office. Adding credence to that assertion, Mr Buhari had said in an interview granted a news magazine in 1993 that Mr Idiagbon was among the three Nigerian military officers he trusted and respected most. He added that the case of Mr Idiagbon was even unique among the trio because Providence had always made Mr Idiagbon to either serve under him or take-over offices he had previously occupied, and he always left those places better off. For instance, the two at various times were sent for training at the Indo-Pakistani region. They both served as the chief executive of the Northern State of Borno, at separate times. Also, Mr Idiagbon took-over from Mr Buhari as the military secretary. Mr Idiagbon was a man who not only chorused discipline, he lived it throughout his career and life. He was a man who utilised the privileges of several offices he held to promote nation-building and national development. He demonstrated absolute honesty, loyalty, and comradeship to the extent that 35 years after he left public service and two decades after his death, no one has accused him of any form of moral or financial corruption. He was, in fact, an epitome of transparency, honesty, and incorruptibility. While he wished and worked for the unity and greatness of Nigeria, he also posted several patriotic contributions to his beloved Ilorin Emirate. He was among those outstanding patriots who assisted in placing the Emirate in the commanding position of the political configuration of Kwara State. He did this by teaming-up with like-minds from across the then Kwara State and beyond led by the late Yusuf Gobir to entrust the political leadership of the Emirate and that of the state on the late third Waziri of Ilorin and the Second Republic Senate Leader, Olusola Saraki. Mr Idiagbon, then a Lt Colonel, served as a member of the main committee, which organised the inauguration of the highly-resourceful Mr Saraki as the political leader of the Emirate and Kwara State through his investiture as the second Turaki of Ilorin on April 12, 1974. Mr Idiagbon's love for Kwara State can also be appreciated in how he encouraged the Kwara state government under the leadership of Salaudeen Latinwo, a group captain, to initiate and launch the Kwara State Industrial Development Fund targeted at promoting the industrialisation of the state. Besides, Mr Idiagbon was also a silent community leader who influenced many of the developmental agenda of the IEDPU prior to, while he was in, and even after leaving office as the nation's number two citizen. Apart from influencing the appointments of many of his compatriots into positions of authority in order to help others, he was always affording the IEDPU necessary and periodic advice on how the interests of indigenes of the Emirate could be propelled and sustained for community development. No one is too good not to have his fault. One of the weaknesses associated with the late Mr Idiagbon was his extreme taciturn nature, which brought him so many misrepresentations. Perhaps, particular experiences are responsible for his reluctance to open-up on issues and experiences that shaped his life. After his displacement from office and unlike his boss, he neither granted any press interview nor made any public statement for people to know where he stood on issues. His lack of will to put the account of his life and times, directly or through someone else, into writing has surely foreclosed for his countrymen and women, the privilege of learning one or two factors that accounted for his unique personality and statesmanship. I also believe that his involvement in military politics was also a mistake. Politics, of whatever nature, is too dirty for a man who believed and expected loyalty and who could neither lie nor withstand betrayal. He should have refused every effort to bring him into it and that would have made him a professional soldier to the core and saved him from the disappointment he eventually suffered from his colleagues. But having said these, I share the view of many others that the late Mr Idiagbon was an uncommon human and humane phenomenon who contributed a lot to the evolution and development of this country as a citizen and leader. I, therefore, suggest that for his heroic labour not to be in vain, the present and future crop of the nation's leadership should endeavour to emulate his discipline, patriotism, seriousness, loyalty, and civility. The present government should also go a step further by renaming national monuments after him. While I urge the Kwara State Government to rename the Metropolitan Square, Ilorin, after him, I think it will also be appropriate to ask the federal government, led by his unassuming principal, friend, soulmate and comrade-in-arms, President Muhammadu Buhari, to confer an appropriate post-humous national honours award on him as he did to the late M.K.O.Abiola and Gani Fawenhimi last year. That will go a long way in appreciating his services and stimulating the interest of the present and future generations in patriotism and national development.